So I'm having a homely soup moment. I know, I know the colors aren't doing me any favors here, but trust me, once you try this soup, you'll be hooked too. This bitterly cold weather has me craving hot filling dishes. 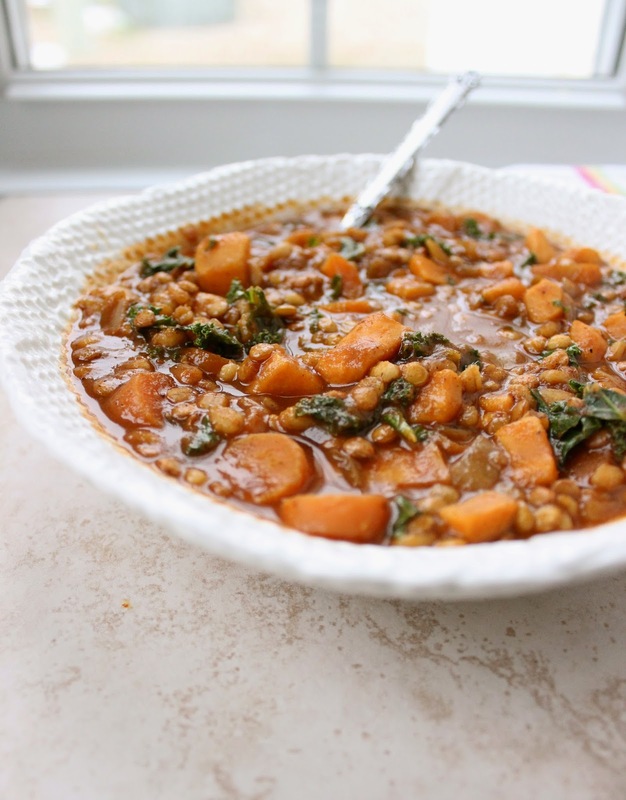 This soup meets that craving while also being packed with nutrient-rich super foods: sweet potato, kale, lentils and barley. It's got everything in it--vegetables, greens, protein, and whole grains. You could serve it with some salad and bread, but you don't have to. This is a complete meal in one bowl. Lentils once had a bad reputation as tasteless hippie food, but don't be fooled--they're wonderful here. They're seasoned with cumin, chili powder, paprika and tomato paste and simmered into soft, flavorful, filling nuggets of goodness. 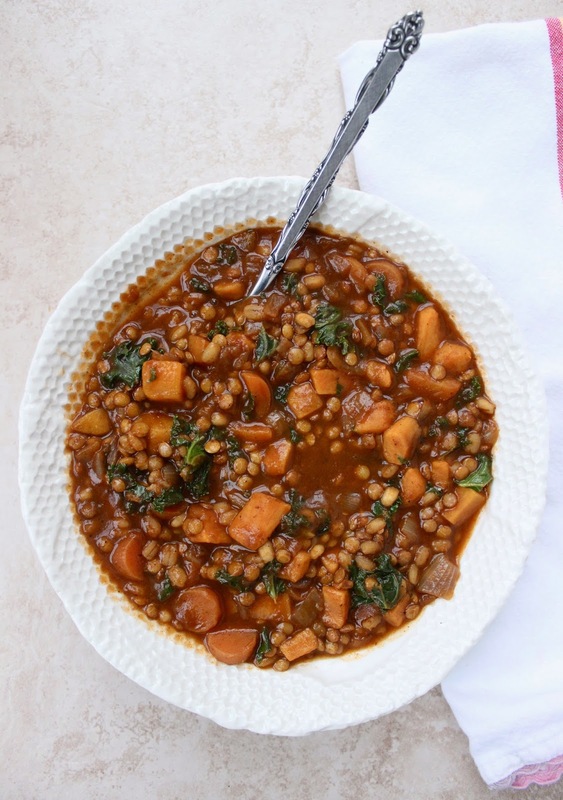 This superfood soup is what we need to power us few the last few weeks of winter. We got this! Add olive oil to a large dutch oven over medium heat. Add diced onion, carrot, and sweet potato. Cook for 8-10 minutes until onions are translucent and carrots and sweet potatoes are starting to soften. Add barley, tomato paste, garlic, cumin, chili powder, and paprika. Stir to combine and cook for 2-3 minutes until barley is lightly toasted. Add vegetable broth. Bring to a boil, then reduce heat to low and simmer for 15 minutes. Add lentils and cook for another 15-20 minutes. Right before you're ready to eat, add the kale and heat through until kale is just wilted. 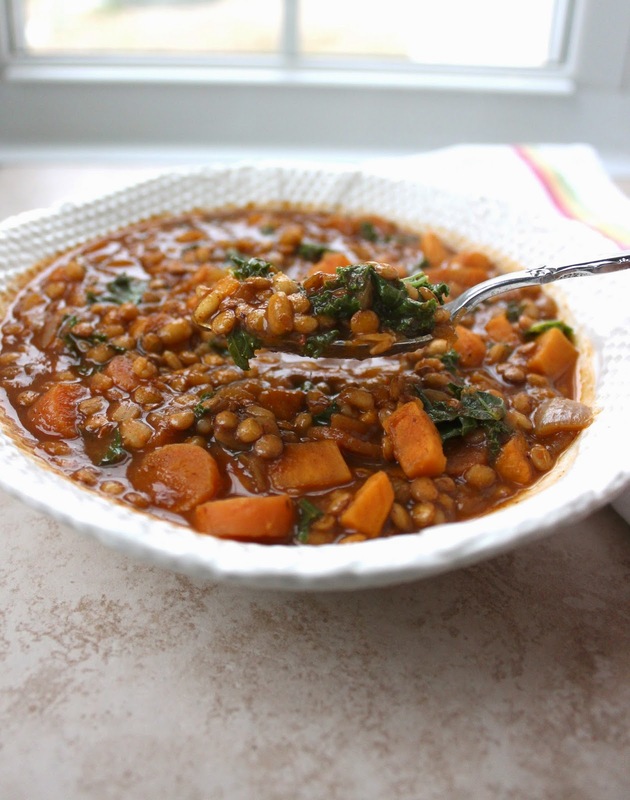 When reheating later, the barley and lentils may absorb liquid, so add more broth/water as needed. Your soup looks so healthy and filling! I love all the good-for-you ingredients - so warming on these cold wintery days. This looks very tasty! I will try to cook this! Since I read this article http://cooker.guru/best-small-rice-cookers-reviews, I want to buy the rice cooker. When I bought it I will try to cook this with rice. It looks very tasty, isn't it?